The plate comes covered in the standard blue protective sheet that will need to be removed before use. Unfortunately, the plate does not have a backing and the edges are on the sharp side. I recommend using something like washi tape around the edge of the plate to make it safer to handle. For this manicure, I painted my nails in two coats of Sally Hansen – White On and gave it a few minutes to dry. I really loved the splotchy image on the top right of the plate and though it would make a great camo pattern, so I stamped over my white nails first with Color Club – Age of Aquarius and then Sally Hansen – Coral Reef. Neither of these polishes are very good for stamping, but I actually wanted to use something that would be a bit sheer so that where the images overlap, it would create another color and give it more of a camo look. I topped it off with a coat of Seche Vite. For this design, I started out, once again, with a white base. These neons are generally fairly opaque, but since I was sponging them on, I used the white to help them pop, even with sheer layers. I used a non-latex sponge and created a gradient using Color Club – Peace Out Purple, Psychadelic Scene and Warhol. Sadly, I was unable to truly capture the neon quality of these polishes, but rest assured, they are brilliant and eye-searing in person (I’ll probably be doing a write up about them in a couple of weeks, so check back!) I gave my gradient a couple of minutes to dry and then stamped on top with Funky Fingers – Gesso. 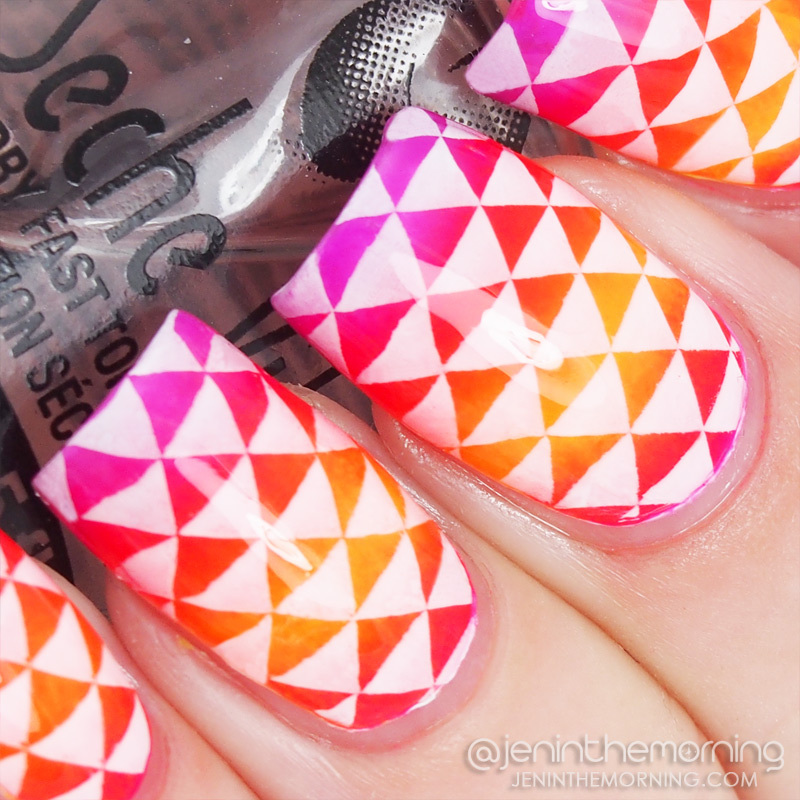 I top-coated with Seche Vite to seal in the design and give the gradient a bit more blending. For my last manicure, I wanted to do some advanced stamping and I chose the vertical chevron image. I created the decals before starting the rest of the manicure and picked the image up in black on my stampers. I filled in the chevron negative space with Ulta – Holiday in Turqs & Caicos (wowzo, this was an untried and it is flipping amazing – but it did cause a bit of staining), Nicole by OPI – Pretty in Plum and Essie – Good as Gold. I topped the decals with a thin coat of Seche Vite and set them aside to dry. I painted my pointer and middle finger with two coats of Holiday in Turqs and Caicos, then using Good as Gold and Pretty in Plum I created a random polka-dot pattern with a medium dotting tool. I placed a new coat of Seche Vite on my decals (while still on the stamper) and waited about 30 seconds to that the top was still a bit tacky and then using the stamper, placed them down on my nail. After a bit of cleanup, I topped all of my nails with Seche Vite. It looked pretty good, but I really love how metallics look when matted, so I added on some NYC – Matte Me Crazy and I am head over heels for this mani! I really like this plate! All of the images picked up neatly and I like the assortment included. My favorite is the vertical chevron, but it is one of those plates where I can envision uses for almost all of the images. 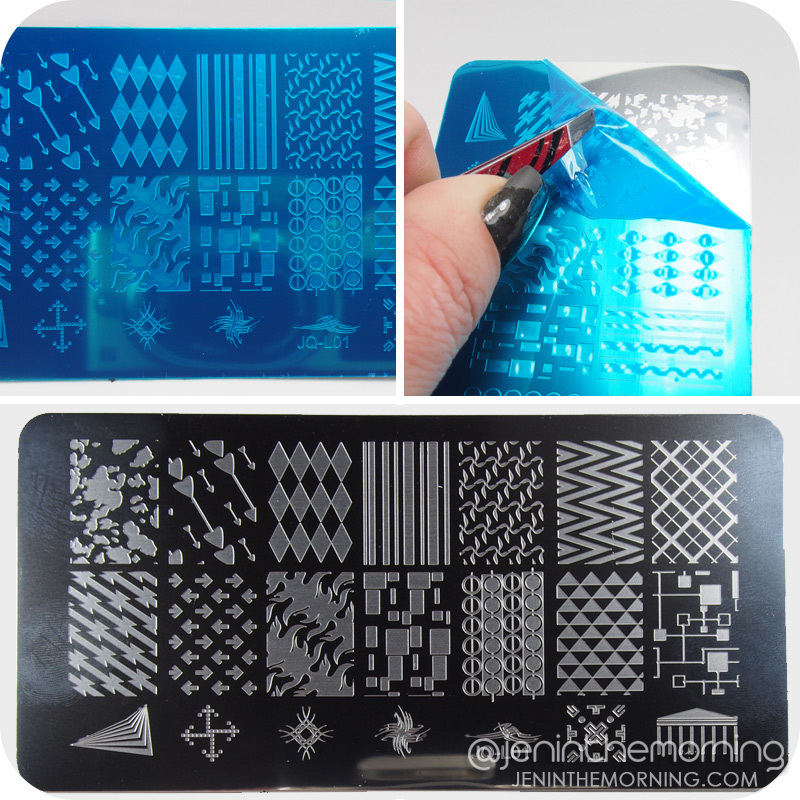 This stamping plate is available at LadyQueen.com (#NA0427) or click here to be taken directly to the item listing! 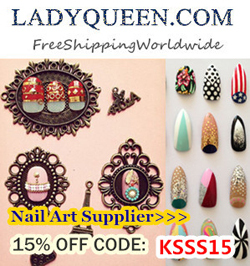 While you are there, check out the Lady Queen selection of nail art! Use my code KSSS15 for 15% off regular-priced items! Which design is your favorite, let me know in the comments below! 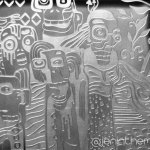 This looks like it has an amazing variety of images on it! And oh my goodness..your stamping is absolutely wonderful! I need some of your skills! This plate looks great, I love all of your stamping! These manis are fantastic! I really love the last one though! Great plate and mani’s. 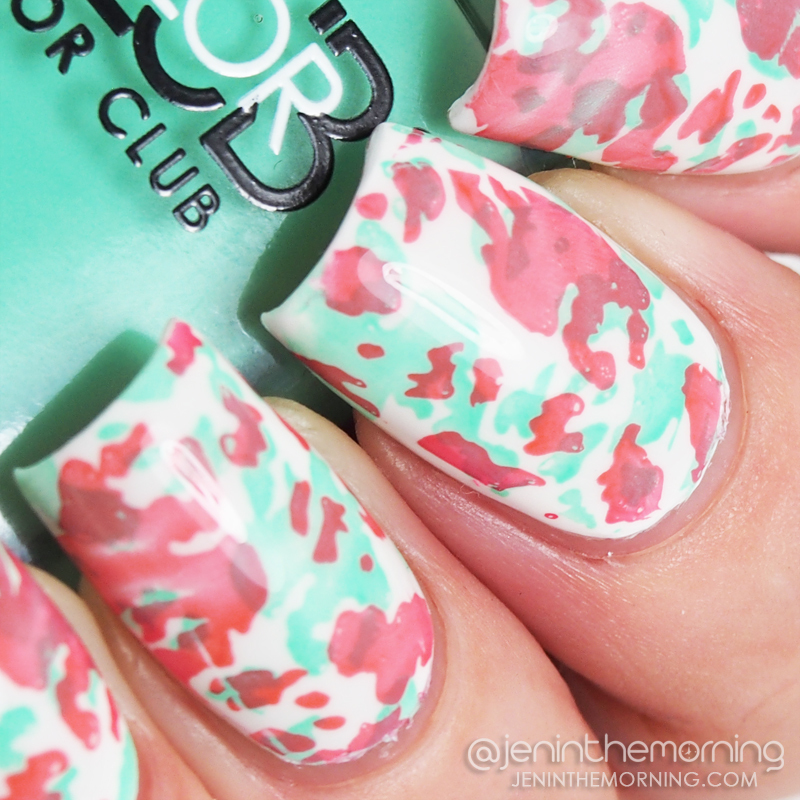 The camo mani is genius! This p,ate has some really cool images, I love the little heart arrows! All if your looks are gorgeous as always! AHHH!!!! I LOVE your last matte look so much! It’s gorgeous! 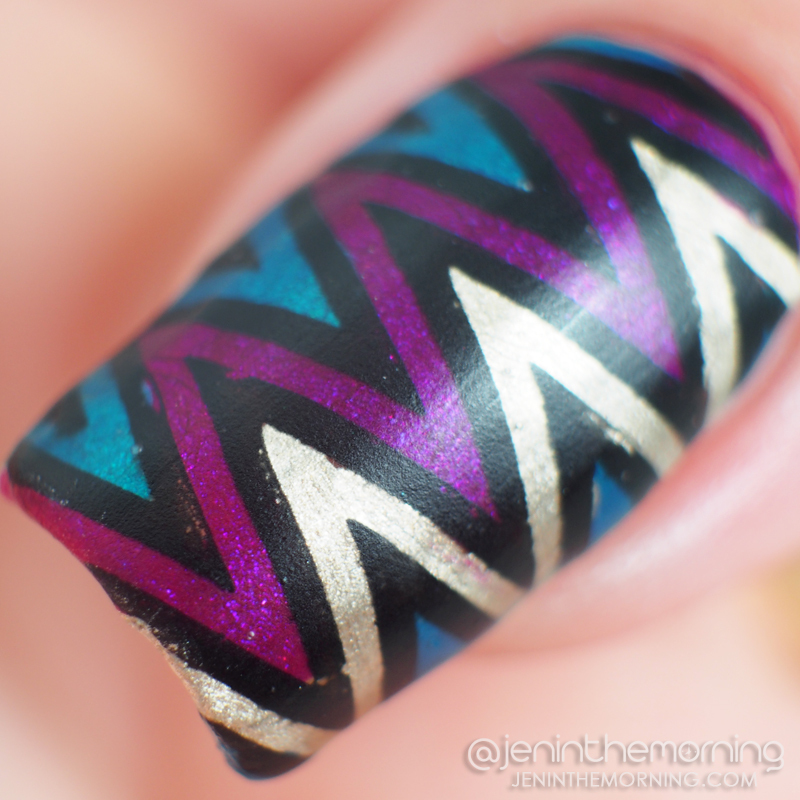 I love the vertical chevron mani! It’s so gorgeous! I love when things are double stamped. Great manis. I’m so in love with all your manis! I definitely need to check these out for myself. That stamped gradient is everything!!! Love it! you created such beautiful nail designs with this plate. It really looks great.